I've been using pihole running on a raspberry pi for a few months and no problems. I migrated over to this docker but have a problem. My sonarr docker is no longer unable to resolve dns lookups. The sonarr docker is running on 192.168.1.2 (same as the unraid server) and pihole is on 192.168.1.10 (same ip I was using when running on raspberry pi). No other docker is using port 53 or 67. If I shutdown the pihole docker and restart the raspberry pi, sonarr starts resolving dns again. I feel like I'm missing something basic... Ideas? I believe this is from the default segregation of docker from the host. I have the same issue. If you give Sonarr a dedicated IP, then the communication between the two should be allowed. I can't find the post but I think it was release 6.4 that added dockers not being able to communicate with the host. Thanks, I try putting sonarr on an ip other than the unRaid server's ip. Update: That seems to have fixed it. Only issue was I had to re-ip several dockers off of the unRaid server ip to get sonarr talking to all of them (sabnzbd,deluge,jackett,nzbhydra2). I guess the lesson learned is to give each docker it's own ip and not share it with unRaid. How does the cache work? I see everything is getting forwarded to my router. Well my router is the DHCP server. I find things working slower than before. So far it works. The reason I didn't do custom br0, was because most of my light switches and smart home devices lost access to internet, also my VPN couldn't reach the pihole because that's how docker network works by standard. Hey all, just updated this evening to the latest release, and I'm getting this in my logs. Any ideas? It quickly just fails and stops after this error. Didn't have any issues with it prior to the update (and no config changes either). Have you looked at the important notes on https://hub.docker.com/r/pihole/pihole? It may help to reinstall pihole so that you get the new template with these variables included. Thanks, @peteknot - shoulda looked there first! Yup - just deleted/re-added (copied all my settings and re-entered them) and all is well. Yup. that was it. Thanks for the heads up! since the last update of the pihole-docker I am kind of insecure concerning a few things. I am also not quiet sure if everything runs as intended. Pihole has a static IP, I can login, seems to run but still i get some weird infos from the logs that I cant asses. Could somebody maybe have a look and explain, how I could get rid of the messages / errors and how to get DNS resolution running? - concerning docker config: As DNS is already set in extra parameters, what should be entered in the docker config under Key 5 (Container Variable: DNS 1) and Key 6 (Container Variable: DNS 2)? Right now, there is 127.0.0.1 for DNS 1 and 1.1.1.1 for DNS 2, so basically the same as in extra parameters. Is that right? - concerning nameserver: although there is 127.0.0.1 setup in the config, the logs spit out 127.0.0.11. Does that matter? AFAIK it is the docker localhost. Modifying /etc/resolv.conf does not help or change anything. Any suggestions? - concerning pihole-docker itself: As soon as i am restarting the docker, the service does no longer start but loops between quits and restart trials (extra parameter: --restart=unless-stopped). Starting the docker from the docker-config (click into name for docker-config, change and rechange a parameter, click apply) on the other hand, succeeds and runs the docker without any certain errors. Weird??? Is that a bug or am I missing something? This probably has something to do with the "nameserver 127.0.0.11" behavior. I would guess so to, but does that imply, that I’d have to change or overwrite my resolv.conf everytime manually? So far that did not work with nano, neither did the docker write the mandatory IPs into the resolv.conf. The entries are not 127.0.0.1 and 1.1.1.1 as they are supposed to. So is there a way in UnRaid to have a docker that is doing required steps on startup without the need for manual changes? Besides the nameserver issue I also get some other messages, that do not seem to be correct, such as "inappropriate ioctl", "dnsmasq.conf is not a Pi-hole file" and a chown error. I am just using the current docker template where I did not changes except IP. Would be awesome if somebody could explain what kind of additions or changes would be needed to fix my pi-hole. I think the --dns argument in combination with the network type set to Custom: br0 doesn't play nice together. Just in testing, when I set the network type to Host, start the container, and check the log, the DNS sets properly to 127.0.0.1. I didn't try Bridge mode because there is a conflict with port 80 and I don't feel like messing with those settings right now but that is something else to look into. I don't have enough knowledge of unraid and how the container networking works to offer a solution. All I can do is point to the behavior I notice and hope that someone with more experience can shed some light. I get those other messages in my log as well but I don't see what negative repercussions there are from that so I personally am not concerned about those. At the end of the day, the 127.0.0.1 issue results in the container failing to resolve DHCP hostnames so you just see IP addresses in the dashboard. Mainly a cosmetic issue. /usr/bin/docker: Error response from daemon: driver failed programming external connectivity on endpoint pihole (846d19887a647cd73a7f4d9d940d6dd7ae3b7c3943a6b6df336c1c2705227f32): Error starting userland proxy: listen tcp 0.0.0.0:53: bind: address already in use. and the docker terminates itself. WARNING: Localhost DNS setting (--dns=127.0.0.1) may fail in containers. and it obviously really does fail. Please, could anyone help out with working settings for an unRaid Docker? Right now, this is just not running properly and for sure no longer as shown in the video in the very first post of this thread. Here's my config (with a few things redacted, and IPv6 stuff removed / disabled to make it a bit simpler). I've had it running for quite a while now, so it's far from a fresh install. Particularly the Important Upgrade Notes and Environment Variables sections, as they explain in more detail the various "DNS" entries. [i] Existing dnsmasq.conf found... it is not a Pi-hole file, leaving alone! You dont get these errors? We are waiting for the official docker container to be updated. Once that happens, we will have caught up with the rest of the group. If you look at the Tags tab, you can see the one we normally use (latest) is 7 days old and there is a dev version that is 3 days old. I got Pi-Hole up & running for a few days. It seems like it's working and is the DHCP & DNS server for my house. It doesn't seem like it's blocking much though. In Safari, I have ghostery and never really noticed may ads or things like that. But if I try Chrome or another browser, I still see tons of ads on websites. Is there a setting to check or adjust? Your total "Domains on Blocklist" could be considered pretty low. The youtube tutorial on the original post provides some good information and has a link to some nice categorized block lists. 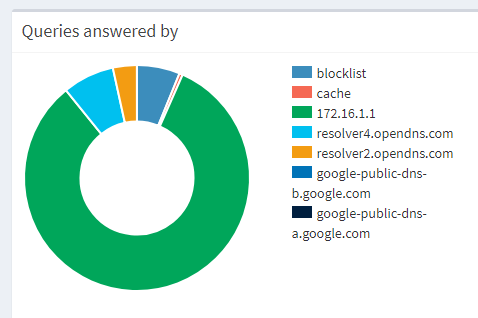 There are also several other references for blocking lists on the Pi-Hole community. Currently I have about 900,000 on my blocklist. This is not close to what is possible and certainly not a recommended number. I am just providing it for reference. With the list I have, the percent blocked bounces around 15-20%. Also consider that the amount of blocked queries is only applicable to your usage. If you have a blocklist primarily for malware domains, but your internet usage stays in the safer domains, then you wont have a lot of hits. If you are blocking adverts and do a lot of online shopping, that hit count is going to shoot up. Ad blocking, telemetry, malicious sites, etc. that you can add to your pihole. For starters, I'd recommend the below list which is all the ones on the website with a check mark next to them. Thanks, I'll give those a shot. Thanks. I followed Spaceinvaders video & added the lists he had. Glad you got it worked out. I recommend taking your time and adding a few URL lists at a time. Pi-Hole makes it easy to add items to the whitelist, but it can be frustrating if you start blocking to much at once. I am currently trying to verify Pi-Hole is not part of my recent automation issues. I think initially I was adding more malware oriented lists and not ad oriented lists. The things that's surprised me with piehole is my freaking Roku and Onkyo receiver are chattering nonstop to things, even when they're "off".